Plans for a new Masonic Temple in Watertown were announced last evening following the completion of transactions by which the Masons have purchased the property at 106 Madison Street which has been used as a parking lot by the Bank of Watertown for its customers. The property lies directly between Otto’s Inn and Powers’ Tavern. The Masons hope to break ground by May or June and that an architect is being engaged in the next few days to prepare plans for the building which will consist of a full basement and the main floor. The basement will include recreational and other facilities while the main floor will consist of the lodge room proper and other related facilities. By a vote of 13 to 1, the common council last night adopted a resolution expressing its desire to secure from the Watertown Masonic Lodge the property in Madison Street which the lodge purchased last week as a site for a new Masonic Temple. The plan was pushed by Alderman Charles Yeomans who said at Monday night’s council committee meeting that he was surprised when he read in the Daily Times, which first broke the news, that the Bank of Watertown had sold the property to the Masons when its officers were aware that the proposed site for the new temple lies within the block square area which has been designated in the City Master Plan for a future civic center. Construction of a new Masonic Temple, plans for which were announced months ago, is due to get underway shortly. It will be constructed on a site in Madison Street, just east of Otto’s Inn. 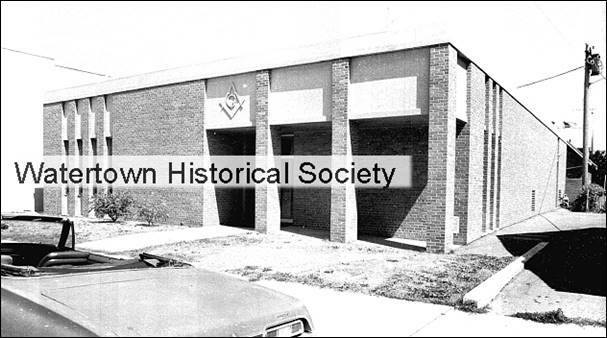 The Masons purchased the site at the time the Daily Times announced the plans for the new building. It was disclosed today that a building permit has been issued for the new temple. The estimated cost of construction, as listed in the permit, is $77,790. Furnishings and equipment will be extra. Sale of the present Masonic Temple to the Chas. Fischer and Sons Co. department store, which has for many years occupied the major portion of the building, was announced earlier. The new Masonic Temple located on Madison Street will be dedicated on Nov. 11. Work on the new building is nearing completion, with some interior work, including painting and decorating, still to be finished. The new structure replaces the old Masonic Temple in Main Street which Watertown Lodge 49, A.&F.M. and other Masonic groups have occupied for many years. The old building has been sold to the Chas. Fischer & Son Co. department store which has occupied the major portion of the building “at the bridge” for a great many years. New building dedicated November 11. 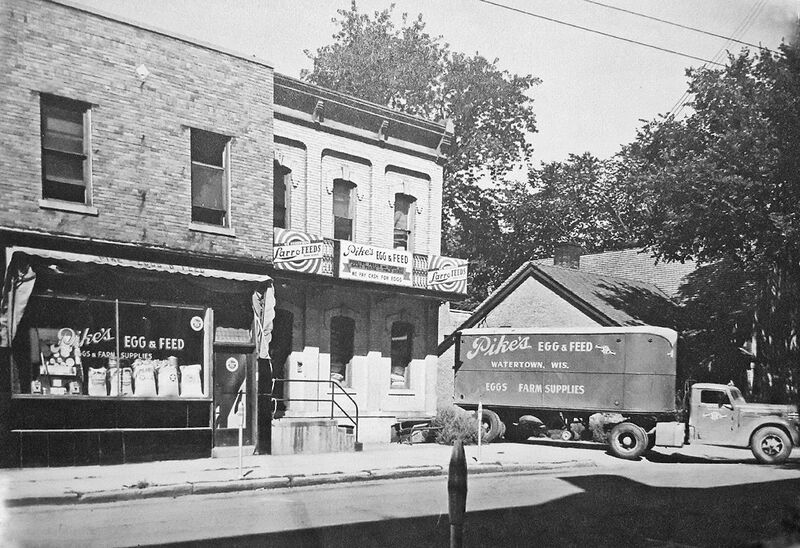 Contractor was H. F. Mallow and Son Co., Watertown. Watertown Lodge No. 49, F. & A. M. dedicated its new Masonic Temple in Madison Street here Saturday afternoon. The ceremonials, participated in by officers of the Grand Lodge of Wisconsin, were meaningful and highly impressive by their very simplicity. A capacity crowd filled the lodge room and there were 300 reservations for the dinner that was served in the evening in the spacious dining room in the temple’s lower level. The new building is a handsome structure, functional in design and multi-level. The dedication ceremonies took place at 4 o’clock and when William J. Dauer, worshipful master of the Watertown Lodge called the gathering to order the place was filled. Watertown Community Church (WCC) has purchased a building located at 106 E. Madison St., the former Masonic Temple building. The building will be used to hold services and special events in the large basement. The plan is to offer as many opportunities for outreach in the community as possible. WCC is a seeker-sensitive church with a goal of making newcomers feel comfortable no matter where they are in their spiritual walk, whether they are looking for a home church or come to simply check out a service. Watertown Community Church recently celebrated the retirement of Pastor Fred Smith and the installation of its new pastor, Keith Young. Smith’s career path has been characterized by diversity. His journey began as a Judge Advocate General attorney with the United States Marine Corps, then as a history professor at Maranatha Baptist University in Watertown, followed by a two-term tenure as Watertown’s mayor, culminating with a 17year stretch serving as pastor of WCC. Young was born and raised in New Jersey. He is married to Doloreza and they have a 1-year-old daughter, Sophie. Young is a graduate of Texas A& M University and received his master of divinity degree from the Southern Baptist Theological Seminary in Louisville, Kentucky. For the past three years, the Youngs have served overseas. Young’s installation service was held April 29 and he officially began his pastoral service on May 1.